I'm having this problem with a 2010 XC70. The air conditioner only blows warm air, unless the car is moving at a speed of at least 50 MPH. This has slowly progressed since late 2016/early 2017. At first, it would blow cold air at low speed and idle, but the travel speed required for cool air has increased with time. Sometimes it will blow somewhat cool air at about ~30 MPH, depending on ambient temperature. One of the radiator fans was replaced in mid 2017, which corrected the engine running hot, but had no affect on the A/C. According to the dealership, they could only tell if the compressor had completely failed (which it had not at the time). It does seem that toggling the A/C on and off from the switch in the center stack can occasionally get it to start, but still no cool air. The cabin air filter has been changed since this issue started, with no affect. I have not yet checked the radiator and condenser for dust and dirt, though there haven't been any engine temp warnings recently. Could this be the compressor, the pressure switch, the refrigerant level (if the refrigerant is low, would it cool at all? ), or something else? The condenser sits in front of the car and is a heat exchanger for the A/C: it needs airflow to remove the 'exchange' heat from the A/C system, or the A/C won't be able to provide cold air inside the cabin. As you drive faster, the more airflow removes the heat from the condenser so the A/C works better inside the cabin. However, normally is the radiator fan that has to provide airflow over the condenser. In warm days, the radiator fan must kick in (normally at low speed) as the A/C is turned on - so this is a quick way to check if the fan works when the A/C is turned on. The fan may also work if the engine coolant needs it, so try this trick upon starting the engine from cold, in a warm day, with the car in P: see if the fan starts shortly (within a minute or so) after turning the a/c on. I checked the fans, and both are functioning properly. The location of the condenser is unclear; is it the round objects in front of the radiator, or is it built into the radiator? Is it hidden under the panel with the hood latch? I think the round objects look undersized for a condenser. 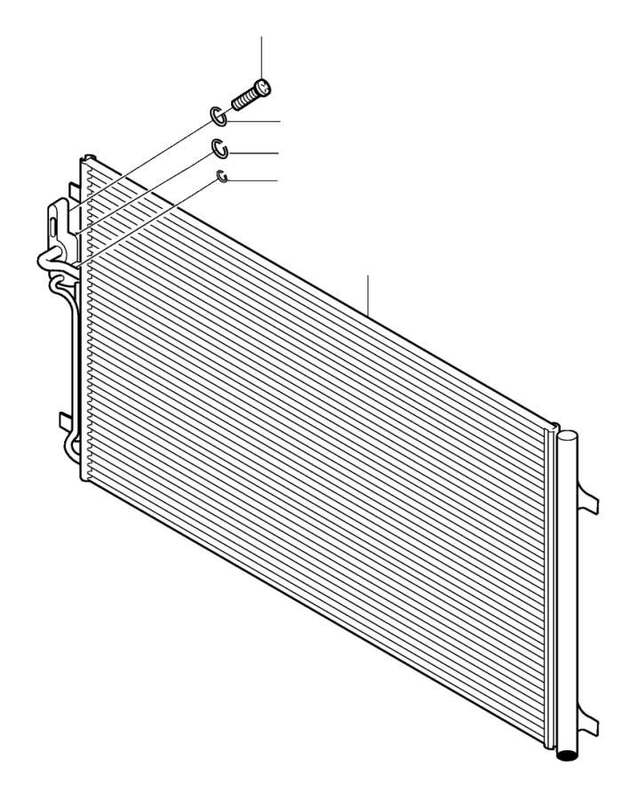 A condenser looks like a radiator and sits in front of the radiator. Like a radiator, a condenser is used to discard excess thermal energy. Will rinsing the condenser with water damage the radiator fans? Is there anything I should remove first? Cleaning the condenser has been delayed due to weather. While waiting for weather to clear up, are there any other possible causes of this issue? Is the compressor engaging at idle? Does it look like it is slipping? The compressor on that car is a variable displacement version. The compressor has an electric valve on the side that varies output of compressor. At highways speeds with engine at higher speed and lots of condenser airflow it will cool a little bit even if it is stuck on its low output position. If the electric valve fails the compressor sticks on low output. Someone with a/c repair experience will need to evaluate this. Gauges will need to be connected to see if the compressor is functioning and if it is not then the signal to the valve will need to be checked. If the compressor is not pumping and signal is at 80% or thereabouts then the valve is stuck. I have the same problem. Do you have an update on your situation? On my 2010 S80 (3.2 - 2WD) the fan doesn't blow most times. Only at highway speeds will the fan blow, very lightly and occasionally. Heat or AC, fan still won't blow. I do have a DTC for the ECC module, where is that located to replace? Can the electric valve be replaced without opening the A/C system? If not, I'm probably going to have it repaired professionally. The blower fan always works, the A/C just isn't cold. The heater works normally.